While we all know that a day consists of 24 hours, 1440 minutes etc etc we also know that some days seem to last twice that long. There is nothing worse than those long days happening when you are at work and every time you look at the clock it seems to be going backwards. It's funny, as you always seem to be able to tell if it is going to be a long, slow day right from the off. The problem with this is that as soon as you slip into that psyche you are there for the day and even if things perk up later on you are still in sloth mode. The perfect solution to those long, slow days at the office? Get some business ecards going the rounds. This Slow Day one is a great one to kick off with. 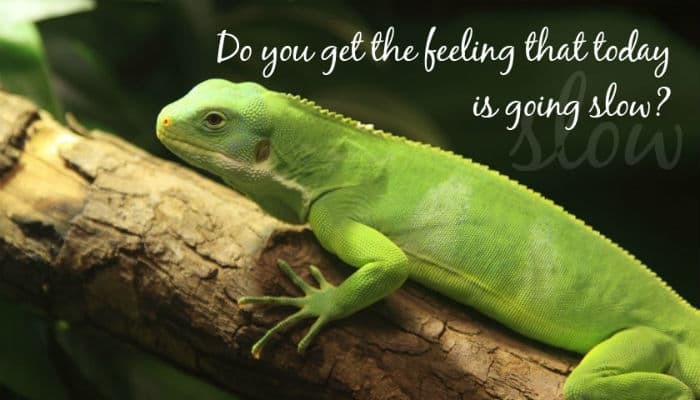 The simple image is of a green lizard chilling out on a branch, but look at his face, even he looks bored! The text reads “Do you get the feeling that today is going slow?”. This lets others know that the day isn't just dragging for them, you are all in this together so hey, let's have some fun to break the monotony! Does your business choose to send holiday ecards to clients at Christmas time? If so then why don’t you pop over and have a look at our market leading business holiday ecards?